Its not quite time to cut my big bhut jolokia back into a bonchi yet, but its getting very close. I'm really hoping for some massive roots once I dig it up, but the ones on the surface now aren't bad. It was a late start getting planted (weather destroyed my first batch), so its just now ripening pods. 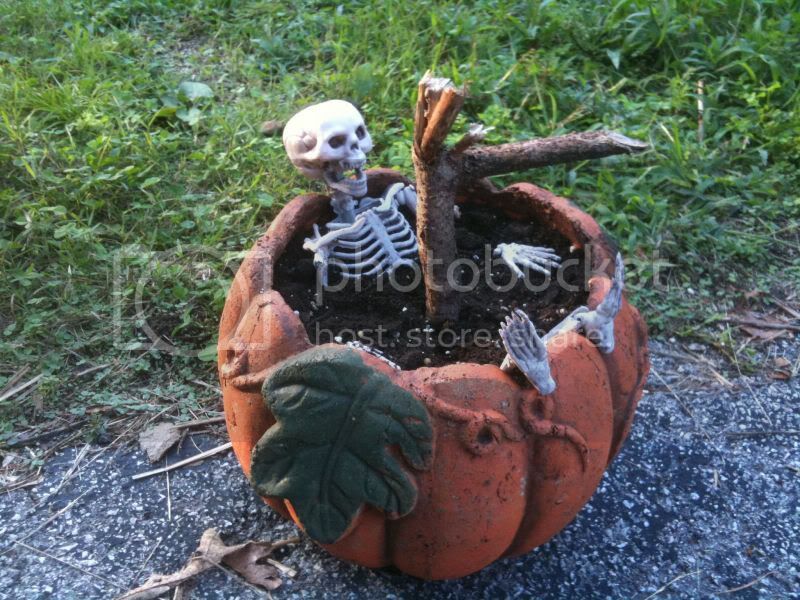 But, it should be ready to cut back in time for Halloween, and considering how deathly hot these things are, I'm going to make a themed bonsai out of it. Thats my rough mockup with a handy stick from the woods. Skeleton is cut apart to only be surface decoration (I've been painting and preparing a better looking one than I used in this test run), should hopefully come out looking quite nice. 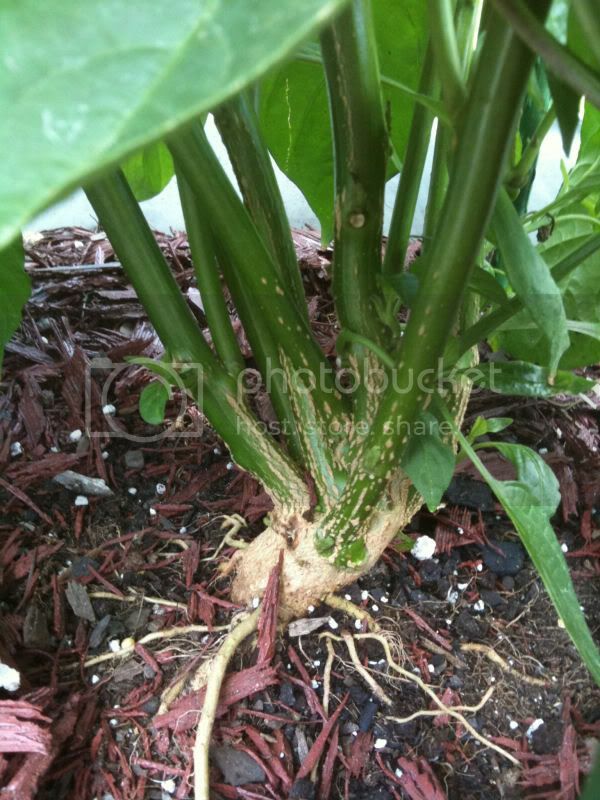 As you can see in the first picture, the trunk of my pepper rather quickly splits apart into a mass of stems. 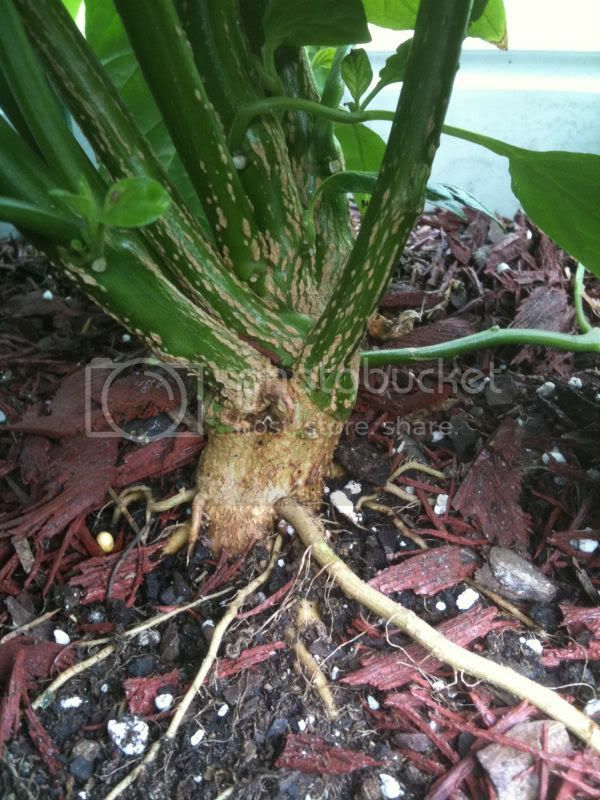 I'm thinking it won't make for a particularly impressive bonchi if I let it stay that way, so I'm planning on pruning a good portion of them off when I cut the rest back. Thing is, I can't decide at the moment which ones to keep, and which ones should go (probably at least attempt to root the biggest ones I break off, so as not to totally waste them). On one hand, I'm thinking it would be cool to prune all of them except the back two or three. Its already growing in a curved shape with the main trunk, I could just follow that curve with the branches I leave and try to go for a gnarly old haunted tree look. Then wire the new growth over in a windswept look following that same curve. Problem there is that would require cutting back at least 2/3s of the branches, leaving a thick fat trunk and then some spindly (by comparison) fingers poking up. I could use the ledge created by all those missing branches for some more decorations though. On the other hand, I could leave all the outside branches and prune away the inside branches and go for a kind of clawed hand look. 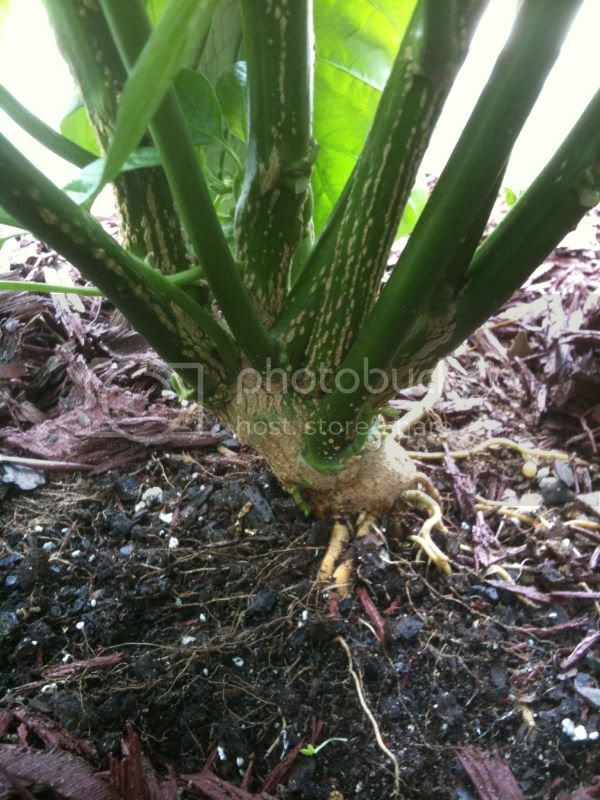 Riskier that way, both in terms of how the final bonchi would look and with getting the middle branches out without damaging the outside ones though. Anyone have any thoughts and/or suggestions? Okay, so I ended up switching plants around due to the one in the original pictures turning out to be naga morichs instead of bhuts, but other than that, same setup. 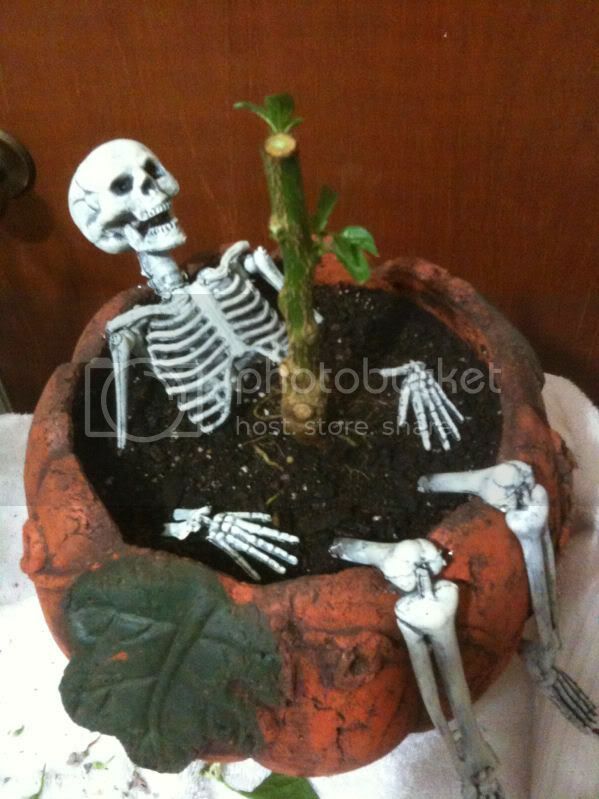 All the parts except the hands are hotglued to the pot so they won't move around on me, skeleton is hand painted and sealed (I'll have to wait till daylight to get a better picture of that), and its just up to the plant now. Yup, I have one of those that I plan on doing the same thing with. Bought the skull as an aquarium decoration, and I'm planning on having a bonchi growing on top of it with the roots spilling down over the face like a melting candle. Should look really good if I can pull it off. I'm testing the technique out now with a sweet red cherry pepper and a cow skull aquarium decoration. I figure that when it's done I can put a layer of sand on top of the soil and make a desert cowboy scene out of it. Hm.. What was the cause of death? Eternal erection or chili impalement? He was preparing bhuts and forgot to wash his hands before going to the bathroom. It wasn't a pretty death. I'm waiting for our friend Edymnion to make a X-mas bonchi. Santa Claus sleeping under a palm tree, taking this christmas as a holiday. Can it be Santa's bleached bones laying on the beach? 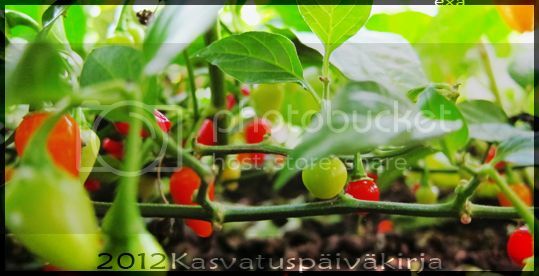 Actually, I had a setup for a desert scene with a sweet cherry pepper on a small cow's skull I was going to do, but the plant didn't make it. Long story short it got the worst case of aphids you ever saw, and by the time I had them under control every new shoot had been crippled, the big leaves were in sorry shape, had to just put it out of it's misery before it infected everything else I'm overwintering.